“We’re all kind of banding together to do this,” said Dr. Todd Justice, an interventional cardiologist at Methodist Medical Center. It’s called Cardiogenic Shock Initiative. Knoxville is one of just six cities in the country to offer it. “This is a good first step in terms of putting Knoxville on the map,” added Dr. Iyaz Rahman, interventional cardiologist at Parkwest Medical Center. But it’s special here because doctors at Covenant, UT Medical Center and Tennova are all working together, sharing data and ideas for best practices. The cardiologists in the city have gotten together to say, ‘This is what’s best for everybody.’ I think it’s incredible that as a city we can come together as a city to pursue this as a strategy going forward,” said Dr. Josh Todd, interventional cardiologist at Fort Sanders Regional Medical Center. The procedure is somewhat of reverse thinking, using their typical device but switching the order of their approach to surgery. 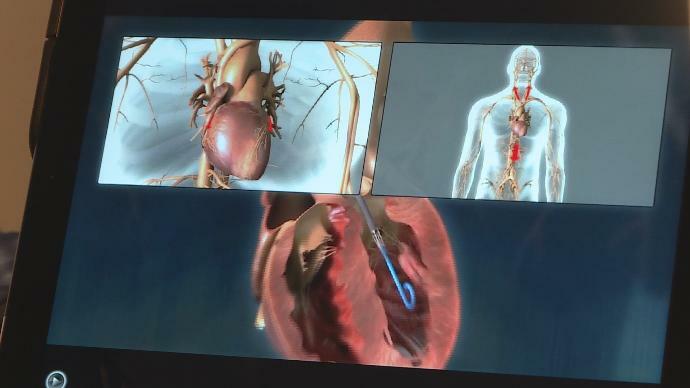 “This is an early intervention that can normalize blood flow to the organs and the heart itself and give it time to recover,” said Dr. Justice. It’s not designed for all heart attack patients, just ones with shock or low blood pressure as a result of a heart attack. “This is a paradigm shift for cardiologists. In the past, the way we approach patients with heart attacks is to take them to the catheterization lab as quickly as possible and open up the artery. Acknowledging putting the device in first may be in the best interest of the patients because you can start recovering the pump while working on the artery,” explained Dr. Rahman. “I liken it to a patch of dead grass in the summer, sprinkler system isn’t working very well. So, in the setting of the pump dysfunction it can’t pump effectively, so you start to get a shut down and the shut down is what we’re trying to treat,” Dr. Todd said. These patients typically only have a 50 percent survival rate. The Shock Initiative brings that survival rate up to 80 percent. “It’s probably going to be on average 30-40 in our health system a year that are going to see benefit, but if you think about it, that’s ten lives saved just from approaching it a different way,” Dr. Todd said.